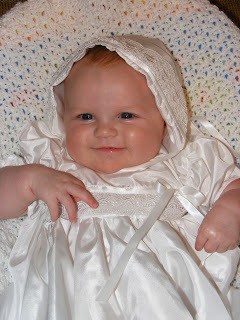 I'm working on Molly's baby book and am needing help! What is the going babysitting rate right now? It's been quite awhile since I last babysat and I wasn't sure. 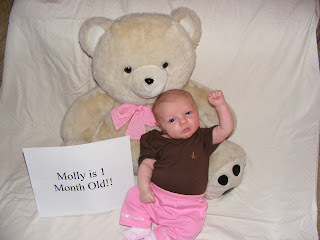 I can't believe Molly Ann is already a month old! This sweet girl is such a blessing to us. We love you precious one!! Molly Ann is 2 weeks old today! Time is flying. We took her in for her 2 week checkup today. 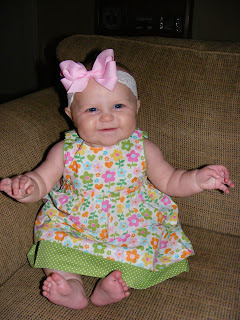 She weighs 8 pounds 8.5 ounces and is now 20.5 inches long (both in the 50th percentile.) Since she is back to her birthweight, well actually .5 ounces over her birthweight, we no longer have to wake her up every 3 hours during the night for a feeding! 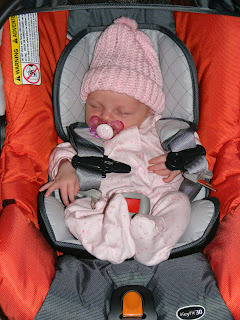 Here's a picture of Miss Molly after her appointment. 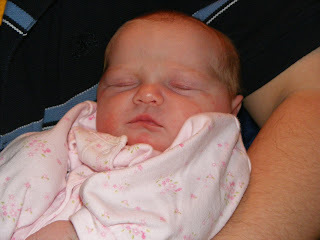 Molly Ann was born on January 15, 2009 at 3:37 a.m.
She is SUCH a blessing!! !